When an anonymous text message arrives with photos of tiny hands and feet—and GPS coordinates—Florida cop Ethan Clark believes it's a prank. Then he follows the coordinates to an abandoned toddler. Handing Janie Doe over to caring child services worker Kelsey Rogers, Ethan thinks his job is done…until the little girl turns out to be a kidnap victim. To protect the child, Ethan and Kelsey stumble into an investigation that digs up a tragedy from Ethan's past. Will they uncover the truth before the kidnappers bury the trail forever? Ethan Clark had always preferred the gentle slap of water on a fishing boat to the raucous houseful of boys that he'd grown up in. He still had that old wooden fishing boat he'd inherited from his grandpa, but these days his ride was a dual-outboard powerboat fitted with blue lights. Policing Florida's waterways kept Ethan Clark out of his house. Away from the memories. Away from concerned friends and relatives, from walls painted with cars and trucks—a room his little boy would never again sleep in. His cell phone buzzed in his uniform pocket. He started to reach for it, but hesitated, his fingers curling into a fist. He'd been getting text messages for the last two weeks. Close-ups of a baby—a tiny foot, the curve of a cheek, a little hand, chubby and creased. He had a trace put on the number, but it was untraceable—a throwaway cell phone. He slowed the boat to a troll, barely making waves, and opened his phone. This time it wasn't a photo. It was geographical coordinates. Ethan keyed the numbers into his onboard navigating system. It was his job to know the ocean well—and as the map popped up, he recognized this spot. Shallows about four miles out, half an hour from his location. If the FWC—Florida's Fish and Wildlife service— had a plane in the area, they could scope it out from the air. He called in the coordinates and asked for aerial backup, really the only kind available on short notice out here. He gunned the big engines on his boat, sending it plowing through the waves. Every stop, even the routine ones, had the potential for danger. A situation like this had all the earmarks of an ambush. The radio squawked. "Marine Four, this is Eagle Two-ten. We've got eyes on that location. Looks like an abandoned boat. Over." "Copy that, Eagle Two-ten. Thanks for the look-see. Over." Abandoned could mean a lot of things. Engine problems. Drugs. Crime scene. Considering the text message directly to him, it definitely could mean the boat was set as some kind of trap. He had a lot of enemies from his time spent in the FBI. The fact that he'd laid low in the years since didn't mean squat. Some of those guys had extremely long memories. "We'll circle until you're clear, Marine Four. Over." The boat in sight now, Ethan slowed his launch to a crawl. Waves slapped against the bow, spraying arcs of salt water into the air. He trolled closer. Even through binoculars, he could see no movement on the anchored craft. Flipping his speaker on, he announced his presence as law enforcement and his intention to board the craft. Nothing. Not a sound, not a movement. The large pleasure cruiser rocked on its anchor with the motion of the waves. He dropped and set anchor in fast, efficient movements, prepping to board the other boat. Despite everything, he didn't have a death wish. Pulse thudding in his veins, he checked his sidearm, took a deep breath… and leaped. The other boat rocked as he landed on the foredeck and braced his feet. He pulled his weapon and swung around toward the driver's position. Nothing. He blew out the breath he didn't realize he'd been holding. Used to the roll and pitch of the ocean, he moved easily toward the stern, checking for signs of what might've happened here. There was no sign of struggle. Every cushion was in place. No scratches or scrapes marred the fiberglass surface of the deck. Ethan heard a sound and whipped around. A little kid's sippy cup rolled in one corner of the otherwise completely empty boat. A blue waterproof tarp covered one section of seats and the space underneath. Only one thing to do. He jerked the tarp off. Blue eyes blinked in the bright April sunlight. A tiny rosebud mouth opened wide to scream. Ethan took a step back. He couldn't have been more flummoxed if he'd found a bomb under the tarp. Instead he'd found a toddler. Social worker Kelsey Rogers stood on the pier at the marina, her hair whipping in the early fall breeze. Her peasant blouse and capris were optimistic. She should've worn a coat, but like most everyone else in Florida, she preferred to pretend that the Sunshine State was always sunny and warm. She dug in the pocket of her pants and pulled out her cherry ChapStick. Uncapping it, she slicked it on and shoved it back in her pocket. She'd gotten the emergency call an hour ago from the FWC. One of their law enforcement officers had found a baby abandoned at sea. Personally, she couldn't imagine it, but since she'd gone to work for the Department of Children and Families she'd seen a lot of things that she couldn't imagine parents ever doing to a child, so she tried not to have preconceived expectations. She could see the flashing blue lights of the cop's boat long before she could actually see the occupants of the boat, but when he made the turn around the no-wake buoy into the marina, she caught her breath. Ethan Clark stood with his feet braced, one hand on the wheel, the other muscular arm around a curly-headed munchkin. She'd met him once before on a search-and-rescue mission in a nearby state park. From what she'd seen, he was the strong, silent type. He commanded respect without saying a word. Ethan cut the engine and glided in to bump gently against the posts of the pier. Even with the toddler firmly gripped in one arm, he still managed to toss Kelsey a line. A worker from the marina, a young man around eighteen, came jogging down the dock. "Looks like you could use a hand." Ethan tossed the teenager another line and within minutes had the big boat securely tied off to cleats on the pier. He pulled aviator glasses off and tossed them onto the console in the middle of the boat. "Kelsey, thanks for coming down here." "Wouldn't miss it. Hi, pumpkin. Wanna come to me?" 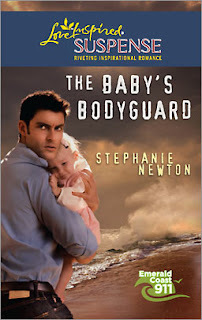 She held her hands out for the baby as Ethan tried to disengage himself from the little arms. The child screeched and wrapped its arms tighter around Ethan's neck. He shot her a what-now look. "Maybe you should get out first—give the baby a chance to become familiar with me." She studied the tot in his arms. "A little girl?" His blank look told her the answer to her question before he could. She grinned. "Well, she's wearing pink overalls, so I think it's a good guess." "All I could really think about was getting uh, her, back to shore. It never crossed my mind to try to figure out a name or anything." Ethan stepped easily across the space between the boat and the pier, balancing not only his weight but the toddler's as well. "Has she had anything to drink?" Kelsey dropped into step beside Ethan as he walked up the pier toward the marina sandwich shop. "Yes, I carry water on board. I also gave her a few crackers." He shrugged. "I don't have much experience with kids." The wind caught a piece of Kelsey's hair and tangled it around Ethan's arm. She laughed and stopped him with a hand on his arm. He didn't move as she unwound the strand, his blue-gray eyes never leaving her face. The baby watched her, too, her little hands fisted in Ethan's uniform shirt. She laughed again. "There. No harm done. I keep meaning to get it cut, but never have time." Ethan took the few remaining steps to the sandwich shop and ducked inside. He dropped into a chair and rearranged the little girl so she was sitting on his knee. Kelsey pulled a chair out beside the two of them and dug around in her tapestry bag. A toy cell phone might break the ice. She pulled it out and punched a button, pretending to talk. "Hello? Oh, yes, you want to speak to Ethan. He's right here. Hold on a second." She held the toy phone out to Ethan, who gave it the same look he might give a live grenade. She wiggled it at him. "Ethan? It's for you." He took it from her hand and held it to his ear. "Uh-huh. Yeah, thanks. Okay, bye." He punched the red heart-shaped button and the phone played a silly song. The baby loosened her grip on her shirt and lunged for the toy. "She's small, but still—she looks seventeen or eighteen months old to me. Did you try talking to her? " Kelsey studied the little girl. Tangled blond curls bounced around the baby's cheeks. "Just the basics. Name, rank, serial number." Kelsey smiled. So there was a sense of humor in there. Somewhere. "In fact, she looked at me like I was speaking a foreign language." He jiggled his knee like a pro. "Hmm. Maybe you were. We've seen a lot of orphans from Eastern Europe in the last few years." She tapped the table to get the little girl's attention and said in Russian, "Hello, baby. Where's your mommy?" No response. No reaction at all, in fact, from the baby. Ethan was staring at her again, like she'd grown a second head. "Was that Russian?" "Yeah, but she doesn't recognize it. It doesn't mean much, though. There are so many countries, and each one's language is just a little different." "Where'd you learn Russian?" The toddler dropped the phone to the floor. Ethan picked it up, rubbed it on his pant leg, and handed it back to her. "Russia." Pulling another toy out of her purse, a play remote control that made noise, she pushed the bright blue button. She reached her arms out to the baby, the toy in one hand. Without a second thought, the toddler threw herself into Kelsey's arms. "Ha, success." She looked up to meet Ethan's steady blue eyes. "I learned the language when I lived in Russia. My parents were missionaries. I've lived a lot of places." She looked down at the baby and made a silly face. Ethan smiled, but not a real smile, just a tilt of one corner of his mouth. It was a start, though. And without the baby holding on to him, she noticed something else. "What's that over your shoulder?" He looked. "Forgot I picked it up. I guess it's a diaper bag." "Do we need to wait for someone to look at it?" The toddler primped her mouth like she might cry, so Kelsey reached into the never-ending purse again and pulled out a bag of Goldfish crackers. "Executive decision." Ethan unzipped the bag, his hands never faltering. He was so serious. So different from her. She bet he never wore flip-flops in the offseason. He tilted up the side. "It has 'Jane' written in marker in the side of the bag. No birth date. Do you think that's her name?" "We have to call you something, don't we, pumpkin?" Kelsey ruffled the little girl's curls. "Is your name Jane?" The toddler grinned at her with a row of pearly baby teeth. "Okay, then. We'll go with Janie." Kelsey handed her a cracker and popped one in her own mouth. "Did you just see an empty boat floating in the middle of the ocean with her in it?" Ethan pulled out diapers and an extra outfit, very well-worn. Then he pulled out a card with a small handprint on it. He laid it on the table and stared at it. "Ah…no. I didn't just find her. Someone sent me to the boat." His hands shook now as he turned over the photograph—a picture of an infant around six months old. It wasn't the one Kelsey held in her lap. "Ethan, who is that?" Her voice grew gentler. It was obvious the picture meant something to him. He shook his head, his eyes on the photo. Kelsey put her free hand over his, blocking his view. "Ethan, look at me. Who is the baby in the picture?" He swallowed hard, his eyes dark with pain. "That baby is my son, Charlie. It was taken right before he died." Ethan shot to his feet. He couldn't figure out how this tiny blonde toddler figured into what happened to Charlie. What was going on? Why would someone use her to get to him? Why would they have him find her? None of it made a bit of sense. Kelsey pressed a drink into his hand. "Drink this. You need some sugar." He looked down at her. "I'm fine. Just trying to figure out if I've missed something."